Irate airline customers can use this illustrative complaint example when asking for compensation over poor service. As a frequent flier of Uphigh Airlines, I am extremely disappointed at my most recent experience with your company. I arrived early for my scheduled flight (#6099) to Chicago. Upon checking the electronic display in the terminal, I saw that the flight was listed as Delayed. I immediately asked the agent if she had any additional information. Despite my polite demeanor, she responded rudely, stating, "You can read. You know as much as I do." As the scheduled time of the flight grew nearer, my anxiety level grew as well. It was imperative that I make my connection in Chicago, and had my original flight been cancelled, there were another airline that could have accommodated my needs. However, another agent of your company assured me on three occasions that the flight was not cancelled, just delayed. Ultimately I learned the flight was indeed cancelled due to an equipment issue it knew would not be resolved for several hours. Even worse, it was the last available flight to Chicago that day. Here is where my frustration reaches its peak: Upon leaving the terminal, I visited the main airline office, where I was told that the flight had been cancelled two hours earlier, but that fact was apparently not passed along to all agents. While weather- and equipment-related delays are understandable, the level of miscommunication by your staff is not. 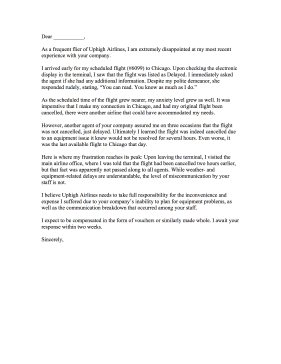 I believe Uphigh Airlines needs to take full responsibility for the inconvenience and expense I suffered due to your company's inability to plan for equipment problems, as well as the communication breakdown that occurred among your staff. I expect to be compensated in the form of vouchers or similarly made whole. I await your response within two weeks.